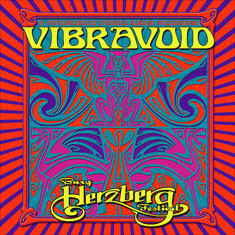 Vibravoid - "Burg Herzberg Festival 2010"
The amazing psychedelic rock band from Germany Vibravoid have released this very special concert they played at Berg Herzburg with special guest Sky Saxon in one of his last ever appearances. The band starts the show off with their version of Tomorrow Never Knows (The Beatles) and a cool but short version compared to some they are known to play. Their single Doris Delay is next and pretty much like the record. Playing with Beuys is next and another short psych rocker but then they launch into the 18 min long Ballspeaker from their first record with Christian playing some monster guitar and some really spaced out parts with his guitar effects. Incense and Peppermints (Strawberry Alarm Clock) was a surprise as I had never heard them play this one live. Your Mind at Ease is another long spaced out track lasting 12 minutes. It has some lovely guitar playing at the beginning, very laid back and spacey. The 2nd CD starts off with three short tracks that they just sort of blast through in 9 mins before the real space out begins. The Silver Apples track Oscillations is next and a very short 2 min version that runs into Christmas on Earth a track from one of the bands cool 7” releases from some years back. Vivid Vision is the 3rd track, another very uptempo one. Now, the next 45mins is something very long and spaced out. It is really nice that they were able to capture the bands live sound at the festival and document the standard Vibravoid psychedelic rock set they have been playing for many years plus the special 45 min version of the CAN classic Mother Sky/Saxon Mantra dedicated to the recently deceased Sky Saxon from the Seeds. I just hope that the band will retire a lot of these songs and come up with a fresh new set as they have so many excellent numbers. An excellent 100 min show.